Channel reports provide a powerful way to extract information from your channels. Using Awasu's powerful template engine, you can export information as HTML, XML, plain-text, any format whatsoever. Open the Channel Reports dialog from the View main menu to manage your reports. To create a new channel report, click on the green plus icon to start the Channel Report Wizard that will guide you through the process. Select the report in the list. Click in the Hotkey edit box in the top right-hand corner of the dialog. Press the key combination you want to use. Click on the button on the right to assign the hotkey. Your reports will also appear in the Tasks Pane for quick access. The first thing to configure is which channels will be included in the report. This is controlled by a channel filter, with any channels that pass the filter being included. You can include all items from each channel, new items only or unread items only. Or you can choose to generate the report from those items currently in a workpad. The default template that will be used if one is not specified. It simply lists each feed item together with any descriptions that are provided. Exports the selected channels in OPML format. Generates a minimal HTML page. The generated report can be used as a starting point for a third-party crawler that will follow links and retrieve content onto your computer. A great use of this is to use it in conjunction with a program such as Plucker which can download content onto your PDA for offline reading later. Generates an HTML code fragment suitable for inclusion in your blog as your blogroll. This report uses the predefined My Blogroll channel filter so all you have to do is put the channels you want to be included into the My Blogroll folder and they will automatically be included in the report. Generates a meta-feed for one or more existing channels. These templates can be customized to suit your needs or you can write your own and use them instead. The generated reports can optionally be stored in a file somewhere, perhaps so that they can be read by another program, or automatically FTP'ed to a web server. Reports can also be automatically regenerated at regular intervals. This is particularly useful when used in conjunction with the FTP feature since it lets you keep content on a web site up-to-date. For example, you could generate a blogroll report once a day and automatically upload it to your blog to ensure that your blogroll is always up-to-date. The meta-channel report (MetaChannel.template) that is installed with Awasu can be used to generate meta-channel feeds, that is, channels that contain the aggregated content of several other channels. Create a new report and choose a channel filter that will control which channels to include. Choose MetaChannel.template as the report template to use. Specify a file to store the generated meta-feed in. Specify how often the meta-feed should be regenerated. 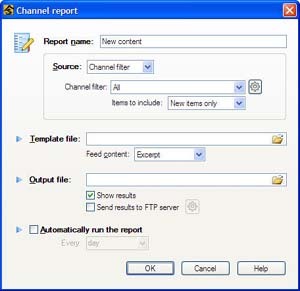 Start the Channel Wizard and create a new channel that gets its feed from the generated report file. Now what will happen is that every time the report is generated, a new feed will be created to reflect the current state of the underlying channels being monitored and stored in a file. Then, when the meta-channel updates, it will read the new feed from the file and notify you of new items in the usual way.